Enter your zip code now to locate health insurance rates that are just right for you. Serving Central Tennessee since 1989, the private insurance company employs between one and four employees. Annual sales are estimated to be from $500,000 to $1,000,000. The company’s goal is to create strong relationships with customers while providing dependable, affordable insurance for everyone. Auto insurance is offered by the company as a brokerage. Shelby can match a car owner with a reliable carrier to get a customer the best auto insurance rates. Commercial auto insurance is available to businesses. Motorcycle and boat insurance can be purchased through the company as well. John Shelby Insurance has a wide array of packages to fit the unique insurance needs of different types of businesses. Shelby also offers Term Life Insurance and life insurance that builds cash value. Term Life Insurance policies cover an indicated number of years, from one year to 30 years. Term Life insurance gives security to loved ones left behind after a death. Whole Life insurance packages increase in cash value and must be held for over 15 years. This insurance can cover burdensome end-of-life expenses such as nursing homes or extended hospital stays. The company will assess an individual, family, or businesses’ needs to put together the most comprehensive insurance package possible. The company also offers a multi-policy discount when different kinds of insurance, such as auto and home insurance, are bundled together from the same company. The company offers a wide array of services from the website. A potential client can request a quote for any of the insurance offered by filling in an online form. Quotes can be saved and retrieved at a later date. Claims can also be filed with links to the partner insurance company. Updates and changes to policies can be filed on the company’s website, too, and will become binding once your personal agent confirms the change. Adding or deleting a driver, filing a property loss and changing an address can all be completed on the Shelby website. Payments can be made through the company’s website through links to the partner insurance company’s website. The Better Business Bureau or BBB, a resource that consumers can use to resolve disputes with businesses, does not have a rating for the company because the BBB has not received one complaint about the company in the last three years. All of the insurance companies that partner with John Shelby Insurance have high rankings from A.M. Best, the recognized leading agency in credit and stability ratings. All of the companies have an A or better rankings, showing that they are financially stable enough to continue to meet financial responsibilities. Shelby is truly committed to working with only the best to provide peace of mind and financial stability to customers. The office is open for business from Monday to Friday, from 9am to 5pm. It is closed Saturday and Sunday. Another option for contacting an agent is to email one of the three agents listed on the website. Emailing John Shelby at [email protected], Amanda Leonard at [email protected] or Kim Shelby at [email protected] will put you in contact with the company. 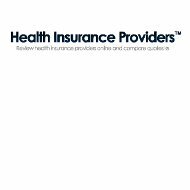 Fill in your zip code to get great health insurance quotes for your area.